Global Equity Markets See Slight Pullback After "Trump Rally"
Subject: Global Equity Markets See Slight Pullback After "Trump Rally"
six + 9 = Required Please enter the correct value. (Kitco News) – Most world stock markets saw corrective pullbacks Friday, following the good gains seen in the wake of the U.S. presidential election. 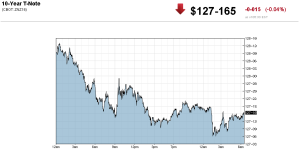 U.S. stock indexes are pointed toward weaker openings when the New York day session begins. The U.S. stock indexes late this week approached or hit new record highs on the "Trump rally." Gold prices are lower Friday as the mid-week surge in the safe-haven metal following the Trump U.S. presidential race win has fizzled. The world marketplace quickly adopted a "risk-on" attitude after being spooked Wednesday, in the immediate aftermath of the surprise Trump victory. A major feature in the marketplace late this week has been rising world bond market yields. In fact, looking at the charts there are very early indications that suggest a major bear market setting in for bonds–after prices had been in a bull market run for many years. Many market watchers believe a Trump administration will produce generally higher interest rates worldwide, due to deficit spending and infrastructure rebuilding. That also suggests rising inflation, which is bullish for hard assets like the precious metals. Another feature in the world markets is soaring copper prices, on ideas a Trump administration would mean more demand for the red industrial metal due to increased infrastructure spending. Copper prices hit a 16-month high late this week and have risen by 30 cents a pound just this week. The key "outside markets" on Friday find the U.S. dollar near steady, after good gains seen after mid-week. Meantime, Nymex crude oil prices are lower as reports overnight cast doubt on OPEC's ability to cut its crude oil production, despite its stated intention to do so earlier this autumn. U.S. economic data due for release Friday includes the University of Michigan consumer sentiment survey. The U.S. government is closed today due to the Veterans' Day holiday. 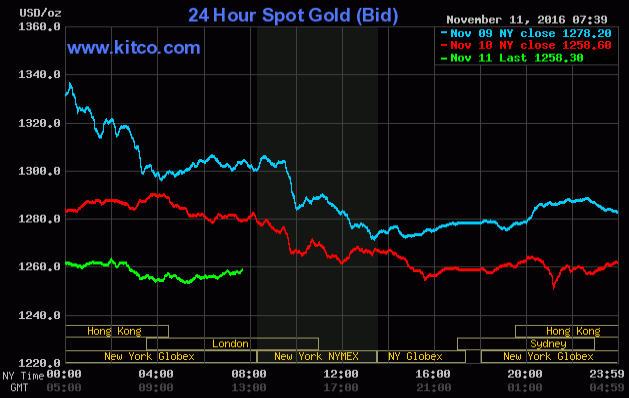 After days of high volatility, the gold market was relatively quiet overnight as it trended lower; spot gold on Kitco.com traded in a narrow range between $1,265.20 an ounce and $1,252.50. $1,250 represents a key support level established in early October.